This essay is a rough draft of a concert review I wrote of the CAKE concert I attended last week. I put it together because I want to remember my impressions of the night. Hopefully, I’ll prepare a more polished version later. The CAKE Entertainment Experience, as lead singer John McCrea billed it to us, amused me in a way no other live concert ever has. The venue was small, and therefore intimate, and a $7 parking pass came with early entrance to the general admission Starland Ballroom. The Starland Ballroom sits beside a junk yard in what appears as an old industrial park and the drive through town brings you through some every-one-identical post World War II tiny ranch homes which heightens a sense of quasi-dilapidated creepiness. The band had no opening act, opening for themselves at 9 p.m., and played two sets. They were hard-at-work promoting their latest album, the self-released Showroom of Compassion. The set list (see below) featured a wide array of songs from their entire discography, which kept the crowd happy and engaged. My husband had remarked that this was the first concert where he really knew all the music of a band, and I didn’t even realize that at the time of the show we owned their five main albums. I came home and bought the one we were missing, and the only reason I hadn’t before is because it was Rarities and B-sides. When they performed a cover of “War Pigs” from that album as an encore, it wounded my heart in such a way I had to go get the missing piece to our collection. The concert was fun and familiar and laid back like hanging out with an eclectic bunch of friends. Picture it as five guys: three dressed casually, but well, in clothes that hung nicely against them; of course there’s one guy with the sport coat and nice slacks (Vince DiFiore); and finally the crazy friend full of big personality, in his trucker hat, bushy beard, light blue zip up hoodie and burnt orange jeans with the faded batch on the back pocket from his wallet (McCrea). McCrea’s conversations with the crowd and guidance for audience participation made the evening feel more like a party, which I suppose is the difference between an intimate venue and a large stadium concert. I’m done small venues before– college sports centers or renovated classic theaters– but I’ve never enjoyed the interaction between audience and band quite like this one. The audience sing alongs were not only fun but became quasi-competitive with the division of attendees to sing the lines from “Sick of You” as McCrea’s “escapists” (“I want to fly away”) and those full of “gratuitous hostility” (“I’m so sick of you”) based on the geography of the room and a disappearing pizza sign, not our true feelings. Of course, the musicians did not disappoint. I don’t even know what exactly Fiore played but I know it was more than simple trumpet and keyboard. He had at least one other percussion instrument in there and something else that sounded like a harmonica but I didn’t catch a glance of it. My husband remarked on how busy he was, and indeed that was true. My main question was how could he play so many instruments for so long and still wear a blazer. He had to be melting! I am not a musician, in any way, but I did enjoy the solos of guitarist Xan McCurdy and watching the work of drummer Paulo Baldi. I couldn’t see much of bass guitarist Gabe Nelson although I could watch his fingers. McCrea did introduce everyone and highlight their segments in various songs. For a people watcher, the venue offered a unique opportunity to watch the younger generation drink too much and pass out on the floor before the show even started. And I watched with captivated confusion as a very inebriated small blonde woman performed a badly choreographed bump-and-grind against her very beefy football player type boyfriend and then tried to persuade the stranger beside them, a sober woman, to join them. The band gave away a Red Delicious apple tree at the end of intermission. The recipient made promises that she would care for the tree forever and send pictures every few years. The Starland itself was recently remodeled after flooding in Hurricane Sandy. The ticket prices were very reasonable at $45/head after the taxes and fees. Apparently, CAKE was one of the first bands to performed at the reopened concert hall. We arrived in Sayreville around 6 p.m. when the concert wasn’t billed to start until eight. We noticed a random dot on Google Maps listed as “Brass Monkey Sports Pub.” Everyone one in our party was not only old enough to purchase alcohol but also of a generation that can recall the words to the Beastie Boys song of the same name, so this was our reason for seeking it out. We found ourselves in a strip mall, near a Chinese massage parlor and an African grocery. At the end unit of the strip mall, we discovered a liquor store. And almost nothing else. We peeked around the corner and there stood a woman smoking a cigarette. She confirmed that this indeed was the Brass Monkey. We headed in, and for a brief moment, based on the strange location of the place and the configuration of walls near the door that didn’t let you see in, I worried that perhaps we had found ourself at a certain kind of bar that involved dancing girls. But no. We had a round of drinks with football on the telly. Some folks played pool in the corner. The rear wall was the back of the coolers in the liquor store which made a queer kind of sense in my mind. That killed almost an hour. From there, we headed into the industrial park. 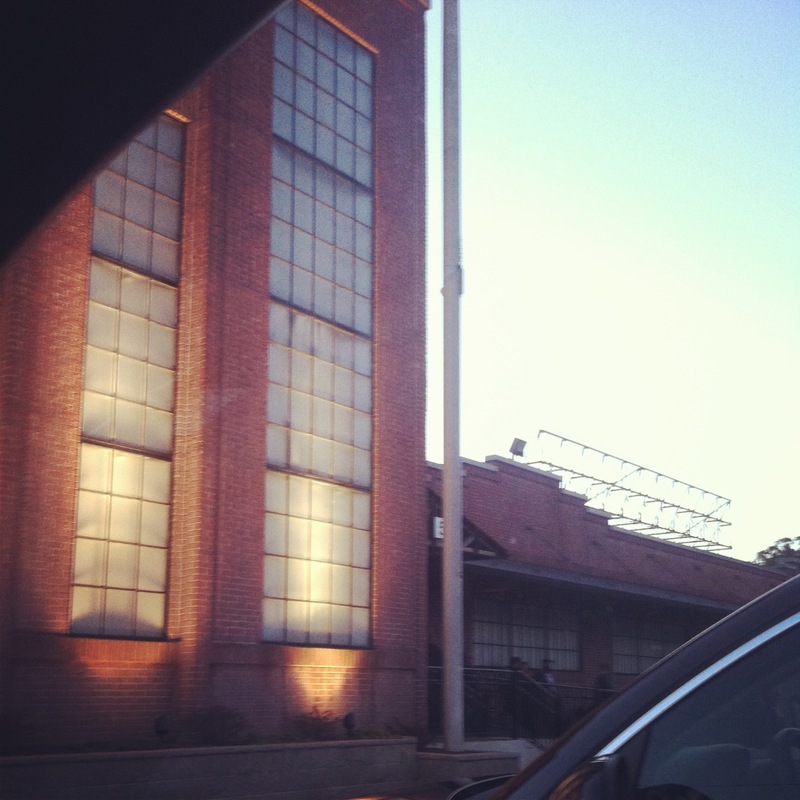 We parked right in front of the Starland’s door. They lined us all up, gave us wristbands if we were 21, and left us there standing under the darkening sky with at least six airplanes circling in a holding pattern overhead. They opened the doors at eight. The crowd consisted of every age, college kids, even some parents and their kids.